Number 74 Fore Street is a magnificent example of an elegantly refurbished town house...with plenty of room for two or more families. 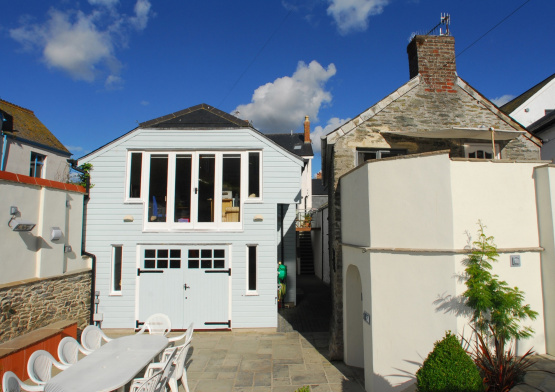 This latest property to be marketed by Salcombe’s leading estate agent Marchand Petit stands behind an unassuming façade in the very heart of the town. Just a stone's throw from the harbour and mooring pontoons at Whitestrand Quay, the upper floors provide wonderful views across the estuary. The property has been comprehensively refurbished with meticulous attention to detail. Present arrangements include the beautifully proportioned main accommodation on three floors together with an attached cottage which can be self-contained or linked as required. Behind, there is a suntrap courtyard which has been superbly landscaped complete with high quality external lighting, which makes it excellent for al fresco dining.